Vilnius, Trakai (Lithuania), Rundale, Riga, Sigulda (Latvia), Tallinn (Estonia), and more! The Baltic States are a tapestry of sea, lakes and woods. Explore the gems of Estonia, Latvia and Lithuania as we visit their fairytale cities, knight’s castles and pristine natural wonders. As we visit these amazing countries, you will discover the turrets, spires, and winding streets of Vilnius, Riga, and Tallinn - three capitals that managed to lovingly preserve the timeless elegance of their Old Towns as UNESCO World Heritage Sites. 8 days/7 nights in the Baltic States, including 2 nights in Vilnius Lithuania, 3 nights in Riga Latvia & 2 nights in Tallinn Estonia. Luxury/Deluxe (5*) accommodations throughout. Juin us also on 3-days pre-tour extension to Belarus! Depart the USA, Canada on any regularly scheduled flight to Vilnius (VNO), Lithuania. Arrival to Vilnius. Transfer to the hotel. Check in to the Hotel Kempinski Vilnius, A Luxury 5-star hotel with breathtaking views of Old Town. The remainder the day is at leisure to relax after your flight. Gather this evening for a festive Welcome Dinner to meet fellow travelers. Our morning tour of Vilnius features the historical Old Town, known for its baroque architecture. Enjoy lunch in the city. Afternoon tour to Trakai, located 30 minutes from Vilnius. It was the ancient capital of Lithuania. Today it is famous for its 14th-century fortress in the middle of Lake Galve. 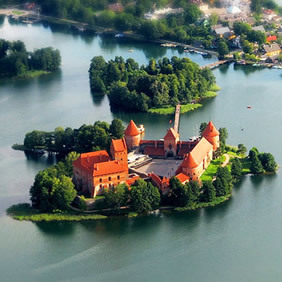 Once a home to Lithuania’s grand dukes, it now houses the Trakai History Museum. The Hill of Crosses, near the Lithuanian-Latvian border, is a unique place of national pilgrimage and an unforgettable emotional site. The crosses, with their handwritten messages, reveal much about the history of the Lithuanian people and testify to their strong will and faith. Pope John Paul II celebrated Mass at the site in 1993. After entering Latvia, our next stop is at Rundale Palace built in the 18th century and presenting an outstanding example of the early work of Italian-Russian architect Francesco Bartolomeo Rastrelli who also designed the famous Winter Palace in St.Petersburg. The professionally renovated palace interiors are decorated with authentic 18th century furniture, paintings and china. We will stop for lunch en route. Late afternoon arrival in Riga, the capital of Latvia. Check in to the elegant Hotel Kempinski Riga, located in the Old Town, which has been on UNESCO’s World Heritage List since 1997. We will dine out this evening at a local restaurant. Enjoy the beauty of this Hanseatic city. The tour encompasses the most significant sights of Riga – Riga Central Market, the Dome Cathedral, the Church of St. Peter, the old Guild Houses, the Swedish Gate, the architectural ensemble called Three Brothers, Old Riga Castle, and the many wonderfully restored buildings, now housing cozy restaurants, cafes, bars and souvenir shops. The afternoon is at leisure to enjoy the city on your own. Our morning tour travels along the central boulevards of Riga, passing by City Canal parks, the Bastion Hill, the Powder Tower, the Latvian National Theatre, and the Fine Arts Museum. Pass the Art Nouveau buildings of the beginning of the century and stop for a visit to the Art Nouveau Museum. After lunch, continue to the Ethnographic Open-Air Museum, one of the show-pieces of Latvia’s cultural heritage, founded in 1924. Situated 10 km from Riga center in a pine forest on the banks of Jugla Lake, the museum consists of some 90 traditional rural buildings: farmhouses, windmills, fishermen’s huts and churches that have been assembled here from the four provinces of Latvia: Kurzeme, Vidzeme, Latgale, Zemgale. 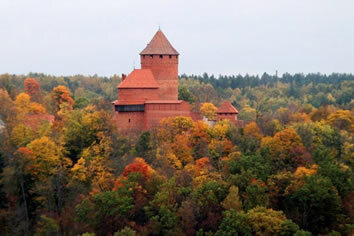 The city of Sigulda, often referred to as the Latvian Switzerland, marks the beginning of the Gauja National Park which includes the remains of Turaida Castle, a medieval cemetery, the legendary grave of the Rose of Turaida, sandstone grottoes and the sculpture garden dedicated to Latvian Folklore. Stop for lunch and in the afternoon drive to Tallinn, the capital of Estonia. Check in to the Hotel Schossle Tallin. This exceptional, boutique hotel is located in a medieval street where merchants and traders lived 500 years ago. 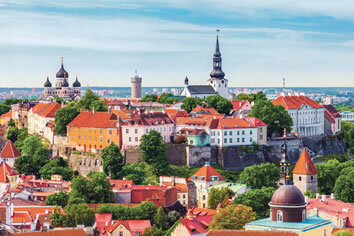 This morning we will tour the surroundings of Tallinn and its Old Town. Among the attractions we included are a visit of Catherine’s Valley Park and Palace, the Song Festival Amphitheatre. You’ll see Tallinn’s number one attraction: Toompea Hill and the Parliament building, Alexander Nevsky Cathedral, Tall Hermann, Kiek in de Kök and Dome Cathedral. The tour ends in Town Hall Square with a view of the Town Hall, a Gothic masterpiece of the 13th-14th centuries. The afternoon is free to explore on your own. This evening we celebrate with a Farewell Dinner. Transfer to the airport for a flight back home from Tallinn (TLL). 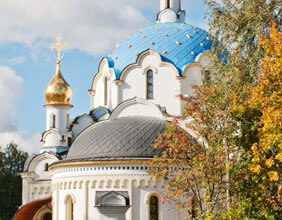 Depart the USA, Canada on any regularly scheduled flight to Minsk (MSQ), Belarus. Transfer to the 5* Hotel Europe for check in. Dinner is at the hotel this evening. Over the next 2 days, we will tour the highlights in and around Minsk, Belarus. These highlights may include St Martyr Grand Princess Elisabeth Convent, “Stalin‘s line”, Ganka Farmstead, the ethnographic Museum Dudutki & The Palace and Castle ensemble in Nesvizh. Depart Minsk early this morning on the Fast Train to Vilnius (2.5 hours). Arrive in Vilnius and transfer to the hotel to join the main group. Kempinski Hotel Cathedral Square is located in the Old Town, at the Cathedral Square, in front of the Gediminas Tower. It offers elegant, air-conditioned rooms with free Wi-Fi and access to the spa centre. The hotel boasts an indoor swimming pool, as well as a variety of body treatments. There is a hot tub to relax in, a sauna and a Turkish bath. Each room at the Kempinski includes satellite TV and a view of the city. Pastel-coloured interiors include heavy, wooden furniture and subtle lighting. There is also a marble bathroom. Guests are welcome to dine in a restaurant or a lobby, as well as enjoy a wonderful view of the UNESCO listed Cathedral Square, or have a drink in the bar. Located in Riga in the Vidzeme Region, 100 m from Latvian National Opera, Grand Hotel Kempinski Riga features a spa centre and sauna. The hotel has a fitness centre and indoor swimming pool, and guests can enjoy a meal at the restaurant or a drink at the bar. Riga Dome Cathedral is 500 m from Grand Hotel Kempinski Riga, while Riga Central Market is 600 m away. Renovated in 2016, this stylish 5-star Schlossle Hotel is housed in 13th and 14th-century buildings and located in the centre of Tallinn’s Old Town. It offers rooms with antique furniture, free Wi-Fi iPads available in all the rooms and a flat-screen TV with DVD player. A'la carte and buffet breakfast is served in the restaurant, and a glass of sparkling wine is served for breakfast. All non-smoking air-conditioned rooms at the Schlossle are bright and decorated with high-quality fabrics and features. There is a bathroom with toiletries, slippers and bathrobes in each room. Guests benefit from a breakfast and usage of sauna included in the room rate. Guests can relax in the sauna, which is free or try a selection of massage treatments. Front desk staff is available 24 hours a day and can arrange limousine. The City Hall is 100 m from the property, and Holy Spirit Cathedral is a 4-minute walk. Palace of Republic is 200 m away. The rooms offer a flat-screen TV with satellite channels and safety deposit box. The bathroom comes with a hairdryer and bathrobes. Guests can dine in the hotel’s restaurant, serving European and Belorussian cuisine, or eat out in the cafes and restaurants nearby. You will need to book flights from Home to Vilnius (VNO) or to Minsk (MSQ) and return from Tallin (TLL). Lufthansa (LH) / United (UA) or Austrian Airways (OS) are among airlines that can be used to book airfare for this tour. We recommend booking at least 7 months in advance if you want to use Frequent Flyer Miles or the American Express Platinum card 2-4-1 program. A valid passport is required for international travel and must be valid for 6 months after the return date. No visa is required for USA passport holders for Lithuania, Latvia, Estonia or Belarus (if staying no more than 5 days.) TWO BLANK PASSPORT PAGES ARE REQUIRED FOR ENTRY INTO BELARUS. Additional pages are required for stamps for the Baltic States. Be sure you have enough empty pages in your passport. All departures are guaranteed on a minimum number of participants. A Coda Tour Manager will accompany a tour also based on a minimum number of participants. This tour can be operated as a Private Tour, can be customized and repriced based on a final itinerary. A complete portfolio of pre-departure information will be mailed to you approximately three weeks prior to departure. Minimum $750 pp deposit required at time of booking. Final payment not later than 90 days before departure.